We started our video from the point when the main red pattern was already created. Up until now the painting process looked more mechanical then creative. To make this pattern you need to have an example of it in front of your eyes. Than just try to repeat the pinstripes of pattern with minimal generalization. In the process of outlining it you may create a slightly different design, improving the original example. The main criteria is to create a repeatable and good-looking design. It definitely takes time but the result will satisfy you. To make such solid and confident red lines, use a mix of opaque Cadmium Red plus transparent Alizarin Crimson – you need it to add a dense and slightly bluish cold nuance. Our advice is to use Liquin Fine Details as a medium for this purpose. This liquid, fast-drying oil painting medium allows you to deal perfectly with fine details. It helps in painting sharp and precise lines without paint spreading out on both sides. This great medium doesn’t leave brush marks and doesn’t yellow. Now everything is ready for glazing. It’s important to allow previous layers to dry very thoroughly. Touch the canvas and if it’s dry to the touch you can apply glazing fearlessly – old and fresh layers will not mix together. As you have noticed we are applying much-diluted thin paint for shading. Because the paint is so diluted and transparent that you can see through it, this glazing reminds us of a watercolor technique. For making shadows on this light shawl, semi-transparent Payne’s Gray is ideally suited. You could use any of your favorite agents as a medium. Do fit all mediums. The only difference between them could be drying speed. If your medium is based on linseed oil, drying time is increased. If you are painting using volatile solvents like turpentine or varnishes and liquines, drying time would be reduced significantly. Working at this painting, we are using Liquine Original which is easily mixed with a brush and flows well. To cover the white under-painting of the model’s dress we are exploiting the glazing method again. 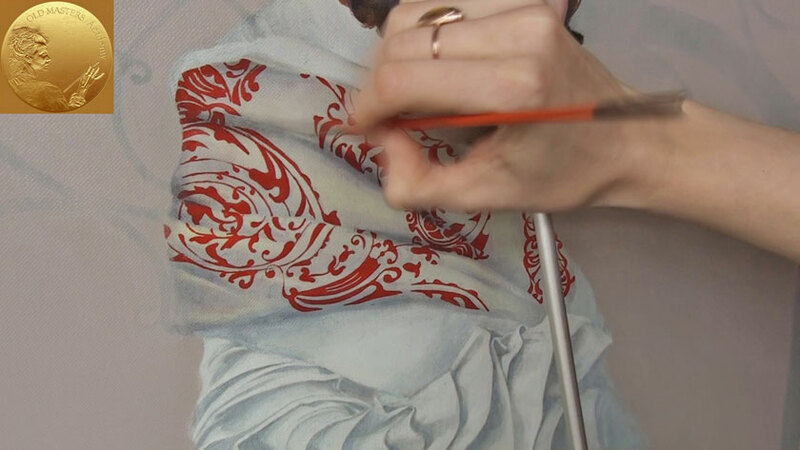 With a new layer of thin glazing film we covered almost the whole area of the dress, varying the thickness of paint according to set tasks – in the center, closest to the viewer, the color is slightly more saturated than on the sides. With the bright soft brush we’re applying thin semi-transparent paint – a mixture of Payne’s Gray and French Ultramarine. 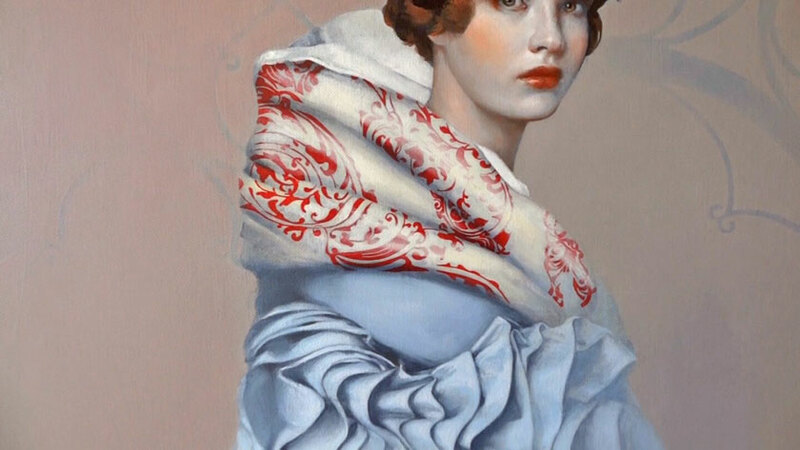 The advantage of such a technique is clear – you could achieve very successful results in your painting that you would never achieve by the mechanical mixture of paints and the application of thick opaque layers. This technique allows previous layers to show through in places where glazing was applied and creates an incredible atmospheric effect. Paint for glazing should be thinned with a medium, so as to become somewhat transparent. Drying time depends on the amount of medium used in the glaze; a higher ratio of medium to paint (producing a very thin, transparent glaze) decreases drying time, while unadulterated oil paint takes the longest to dry. At the end of painting the shawl, you have a chance to play with highlighting. By adding a little bit of Naples Yellow to White you could create an interesting yellowish tint for warm highlight spots on the bends of the folds. At the most lighted places highlights could merge with the main color of the shawl, and the red pattern may even disappear in the most highlighted places. 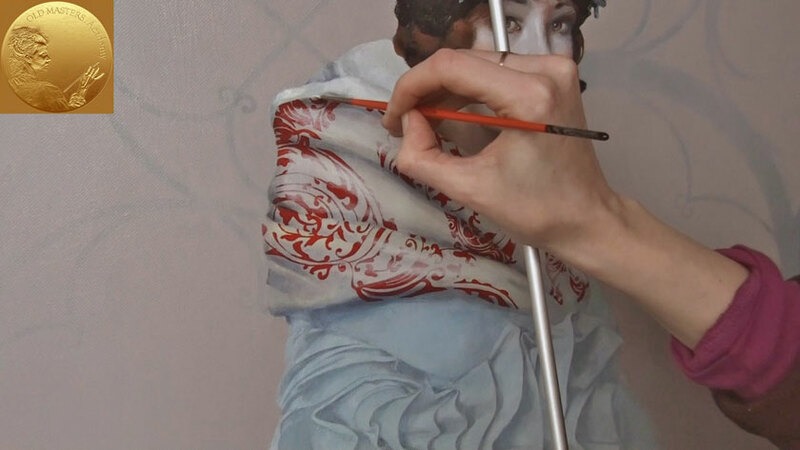 To give freshness to the painting, you may add a few final touches with white color.